Prague (Czech Republic), 13.8.2011. Thousands marched in Prague on Saturday for the climax of the Czech capital’s first-ever gay pride festival, defying a fine drizzle, a political spat and protests by conservative groups. With many in fancy dress, blowing whistles and waving flags, they gathered in the city centre in the early afternoon to set off along several main routes to the sound of music from loudspeakers mounted on vans. Attracting participants from other parts of Europe as well as the Czech Republic, the parade ended two hours later on an island in the Vltava river for a series of concerts and shows. “According to our initial estimates, five thousand people participated in the parade and 10,000 came out on the streets to witness the event,” organiser Czeslaw Walek said. 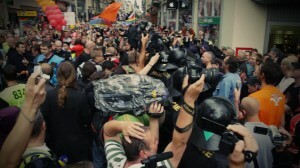 Some 300 police were on duty to prevent the sort of clashes that marred a gay march in Brno, the country’s second city, in 2008, when right-wing extremists pelted marchers with eggs and fireworks. 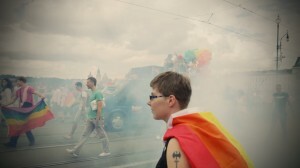 The five-day festival, which began Wednesday, sparked controversy long before it started as a top aide to conservative President Vaclav Klaus labelled gays “deviant”.